Yuji Naka, probably best known for his creation of Sonic the Hedgehog, returns with development studio Prope to deliver a game that has been over 5 years in the making. Rodea the Sky Solider started life as a Wii game, but due to publishing issues, was shelved. The game was picked up again and ported to both the Wii U and 3DS, as well as releasing the Wii version as a bonus to the Wii U game. We’re reviewing the Wii U version. Saying that, when we loaded up the game, we weren’t sure whether it was the Wii U or Wii version, simply because the graphics looked horrendous, even by the Wii U’s standards. 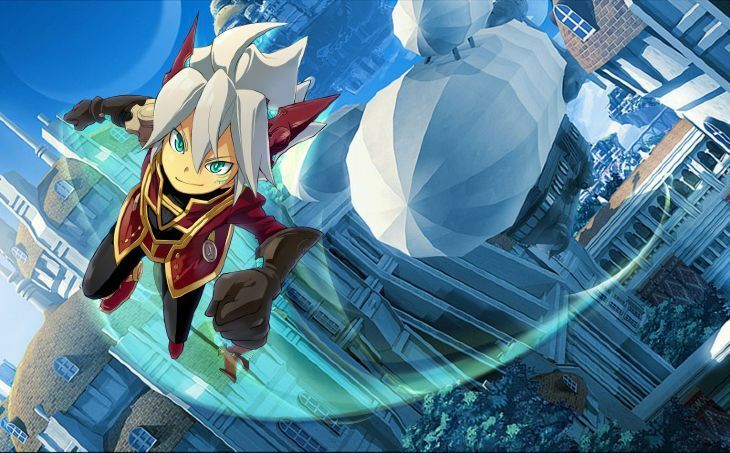 Rodea the Sky Solider looks like a game that came out on the PS2, which 2015, is entirely unacceptable. It shows very little love was put into the port and quite frankly shows laziness from the developer. It’s not like the quality is rescued on the gamepad screen either, as you’ll either get a screen with just the logo or a side-character looking back at you, like you’re in some form of awkward stand-off. Oh and the framerate dips are frequent. Very frequent. Not that the graphics are the worse problem, more-so that you’ll spend most of the time not being able to see them, as the camera seems to have been programmed by a 5 year old. You’re constantly in an uphill battle against the camera, trying to shift it so that you can see what you’re doing, which usually leads to some narrow escapes or just your frustrating death. This also makes the fiddly controls even harder to get used to. Basically, it’s “A” to jump and fly, with the right stick to aim and “control” the camera, with “B” being your attack button. It’s simple, but a little crammed together, with one button being responsible for many actions, which continues to show the lack optimization in the port to Wii U. The story itself is aimed at a young audience, with you playing as Rodea, a robot solider who has to protect Garuda from the evil forces of Emperor Geardo. While Rodea succeeds (although it’s not overly clear) he gets sent to the desert where he falls into disrepair. 1000 years later, Rodea is repaired by Ion, one of the world’s most annoying side characters, who is a bit haphazard. Conveniently, Geardo also returns with his army and so Rodea sets off to fight the swarms of enemies, this time equipped with heavy bouts of amnesia. The plot is rather generic, told in a rather generic fashion complete with cheesy dialogue that makes poor attempts to conduct what it thinks is humour. The game does have one thing that shines though, and it’s the upgrade system for both Rodea and his weapons. As you beat enemies, they drop parts which you can collect. These then can be used to upgrade armour, speed and the amount of damage you dish out, as well as things like ammo storage improvements. It’s a basic system, but in this game, it’s a godsend and seems to be the most thought out system in the game. This does add a level of replayability, as does beating you score on each level and collecting the legacy medals that are hidden throughout the 24 or so levels that Rodea the Sky Solider has to offer, not that I can see why you’d put yourself through that though. The soundtrack is another bright point in the game, with catchy music that fits the environments well without sounding generic. This is marred by the fact that the sound effects have been programmed into the game by the same child who programmed the camera. The sound effects are considerbly louder than the rest of the audio, meaning you can’t sit with the TV remote less than meter away, otherwise you run the risk of being randomly deafened by a collectable or an enemy. It’s a real shame, and again, is something that shouldn’t be happening in games that are released in 2015. Yuji Naka proves that once again, his name is not a byword for quality, which is a shame because Rodea the Sky Solider has some amazing ideas that are ultimately, poorly implemented at best.